Red-breasted Nuthatches are found in some of the coniferous portions of Cedar Creek in all seasons at least in some years, and are probably resident there. They are usually present in small numbers in the cedar-tamarack-pine areas near Corniea's cabin and in the pine stands near the end of the Lundgren Branch. Their numbers apparently fluctuate considerably, and in some years they are rare or absent. In other years they have been found just north of 24 and Lawrence's cabin, by Cedar Bog Lake, and by the duck pens. During the late summer and early fall, migratory Red-breasted Nuthatches pass through the area. The spring migration is less noticeable. White-breasted Nuthatches are common residents throughout the deciduous woodlands at Cedar Creek, and are less common in the coniferous portions. 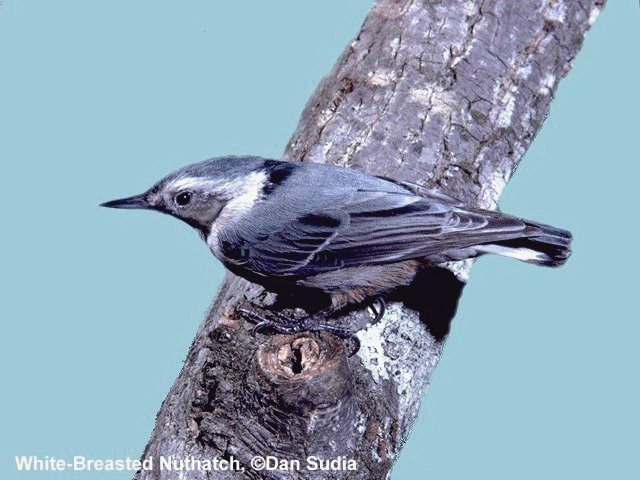 All the White-breasted Nuthatch nests Howitz has seen at Cedar Creek have been in natural cavities in oaks.